Hey folks, I'm in the process of loading up my bug tracker with all manner of tasks, current and future. This includes bugs in past projects that have gone unresolved. So far I've logged a bug for Ys V and a bug for Rudra, and I'm aware of (and have fixed nearly all of, privately) SMT1's issues. I have some tasks logged for current projects, which I'm using to help keep me on track, and some bugs logged for Dark Half which is undergoing testing. But I know there are more out there. A handful of fixes that need to be made to Rockman & Forte, for instance - but I don't have an immediate handy record of which ones. So, this is an open call. Anyone have an issue they'd like to report? Screenshots and savestates are handy - I can attach them to my bugtracker - but if you do submit a save be sure to specify what emulator it's for! Thank you for that But really, that's not what this is about. If I've learned one thing over the years, it's that people will yell at me that X is broken, I'll duly note it, then it'll get buried in my forum somewhere. The whole point of this is to have as exhaustive a list as possible, all in one place. I think Rockman & Forte had one bug with garbled letters when asking if you wanted to erase your "CD database" (To enter the Erase menu, you highlight the save file you want to delete and press L+R+Select+Start) on the lower part of the screen. I remember that there was one of the Robot Masters with the wrong name, I think it was Woodman, which was called Windman (Number 16 Robot Master). Sorry if I can't remember any more. It was so long ago... I need to replay this one. In any case, for which emulator would you like a save state for those bugs? I guess Snes9x , but I rather ask first in case. EDIT: I made the savestates for Snex9x just in case I'm not here later. You have the screenshots and a savestate for both things. By the way, the bug for Rudra is that one in Surlent's Story about the Thor Volcano portal? I remember documenting all the bugs I encountered in Hourai during my playthroughs and sending you the complete list, screenshots and suggestions included. It was a few years ago, but I still have everything and can resend or post here if need be. It's a bit lengthy, mind you. I sent you a message a long, long time ago about two little bugs I found in Live-A-Live, but I never even received acknowledgement. At the time I figured that you were probably done with the project and/or had a perfectly reasonable policy of not replying to such things. and one of the lines came out garbled. I might still have the screenshot. I also took this one screenshot during the credits where there was a bit of garbage on the screen, but it's kind of hard to miss. Thanks, I'll get these logged. And no, the bug I'm referring to with Rudra involves the fact that 12-character mantra names overwrite the bytes that keep track of stat buffs in battle (whoops). Tactics Ogre bugs do not count? They only don't count if they're not caused by the patch. So like the window priority thing when viewing your party during intermissions in zsnes? Not my fault. edit: If and when I try the game next time sometime in the distant future, I'll probably try playing it with bsnes-plus and if I catch the bug only from the patched game, I'll notify you. Since I was unsure whether you still had my Hourai bug reports, I'm reposting everything just in case. It's mostly text bugs and a handful of technical issues. What it doesn't contain are known bugs that had already been reported in the Pantheon just after release. Since the list is pretty substantial and contains a lot of screenshots, instead of posting it in the forums, I've uploaded it here. Clock Tower. When you reset the game like one or two times, garbage tiles appear after some bits of text in the intro. ("with her friends" "fifth time you asked" "don't worry" "it's a nice place"). As the bugs of Hourai High when you finish some chapters with the Text speed in fast? 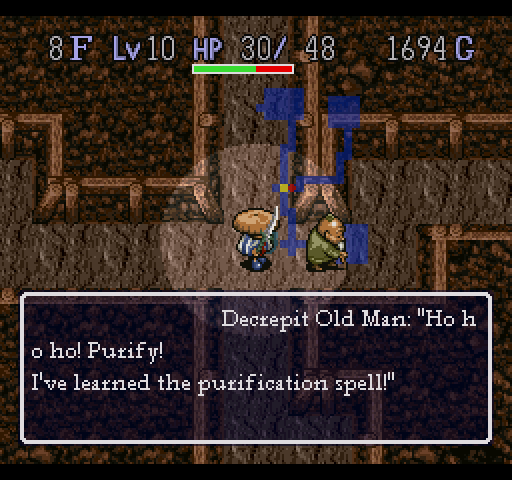 In Shiren the Wanderer, whenever a Gamara steals from you it says it stole ':Arrow' and nothing appears to be removed from my inventory. I sent you an email about this in 2008. Never got a response though, probably for the reasons you mentioned. In Dark Lord, when you're selecting members of your party (after they've been created), you can press Select on any of their names to pull up their stats. The stats window pulls up about halfway, and then the game crashes. In FCEUmm, it just shows a green screen. In Nestopia, a sprite glitch appears in the lower right of the green screen, and a sad little song plays. No pictures, but it's really easy to duplicate. Somebody mentioned 'Adventures of Hourai High'--and as someone who has suffered through the mess of bugs that plagues that game, I second a look at it. I had to fight the final boss 5 times because the game would freeze anytime I used a resurrection item/spell. That text speed bug that froze the game between chapters was a total joke too, and I believe I was told none of the bonus stats from equips really did much of anything at all for some reason. EDIT: Another bug I just remembered but I didn't see mentioned involved the game freezing whenever I tried to join a certain combination of clubs--I believe I tried to join Cheerleading after Kendo, and when I tried to join it, I just got a black screen. Dear God I'm having so many flashbacks right now. I believe I was told none of the bonus stats from equips really did much of anything at all for some reason. This is the case in the original, unhacked game. I'm hesitant to change this as it could alter the current (and possibly intended) gameplay balance. I've fixed some bugs in Hourai already, but in so doing I appear to have caused other bugs. The game is not friendly to work with. In Assault Suits Valken, most of the times after you select Continue, the stage title is displayed as garbage. It's OK, since I personally finished the game already, it's not a huge deal to me, but anytime anyone brings up the game, I just start going into Hulk RAEGE over all the bugs. I just needed to vent again, really. I just wanted to add that this is probably my favourite title you've tackled. I've been trying to beat it off and on since the patch came out. This year's gonna be the one I swear!